On June 7, Tehran fell victim to coordinated terrorist attacks at the Parliament (Majles) building, a symbol of the democratic element in the Islamic Republic’s power structure, along with the more traditional shrine to the regime’s clerical founder Ayatollah Ruhollah Khomeini. At least 17 people were killed in the twin attacks and more than 40 people were injured. In response to the attack, Iranian Foreign Minister Javad Zarif told reporter that the terrorist incident will ‘strengthen the resolve of the Iranian nation against terrorism’. American President Donald Trump sent, to use Zarif’s words, a ‘repugnant’ mixed message response to the terror attacks: ‘We grieve and pray for the innocent victims of the terrorist attacks in Iran, and for the Iranian people, who are going through such challenging times’. Effusive in his sympathies for terrorism attacks elsewhere, Trump added a disclaimer to his message of condolence to the Iranian people: ‘We underscore that states that sponsor terrorism risk falling victim to the evil they promote.’ To add insult to injury, on the same day as the terrorist attacks, the US Senate advanced a new sanctions bill against Iran primarily to target its ballistic missiles programme. If passed into law, the bill will further complicate implementation of the historic Iran nuclear deal. 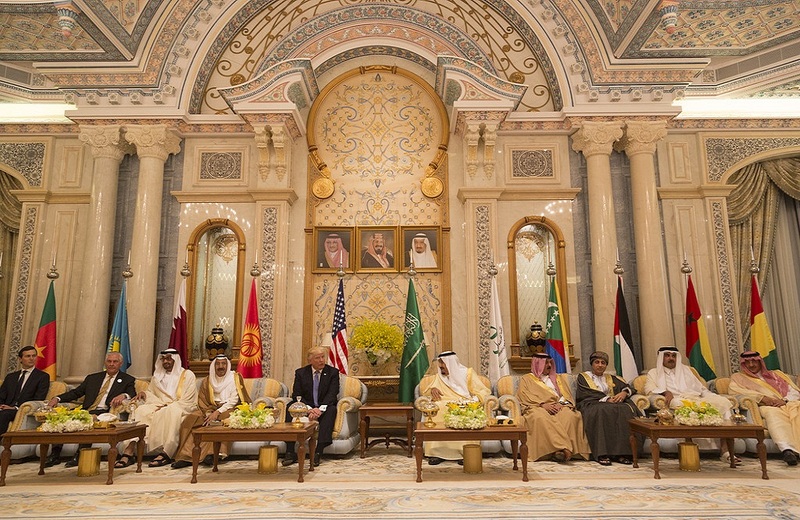 Days before the terror attacks, on an Iran-bashing tour of the region, Trump poured $350 billion worth of arms to Saudi Arabia, over 10 years, to ‘support the long-term security of Saudi Arabia and the Gulf region in the face of malign Iranian influence and Iranian related threats.’ Unremittingly hostile, at the Riyadh summit, Trump unconditionally sided with Saudi Arabia by calling for all nations of conscience to isolate Iran. Instead of reaching out to Iran about greater cooperation against a shared enemy, with tentacles that spread far and wide, Trump chose to deal arms. Rather than initiating a dialogue with the moderate President Hassan Rouhani who has just secured a second term in the face of ongoing conservative resistance, Trump chose to strengthen the US-Saudi Arabia-Israel alliance against Iran and to stoke the flames of intra-regional conflict. Rouhani has clearly highlighted that he is open negotiating with the West, and even with Saudi Arabia on issues like terrorism. The fact is that not a single Iranian has been involved in any of the terrorist attacks in the region or anywhere else in the world (note that supporting a movement such as Hezbollah is not on the same level as colluding with Daesh or Al-Qaeda). In Iraq and Syria, Iranian militias are battling the staunchly anti-Iran and anti-Shia, Sunni terrorist outfits. The irony is that Iranian militias are actually cooperating with the US in the bid to defeat Daesh terrorists in Mosul. Trump’s lack of long-term, strategic foresight brings with it the risk of history repeating itself. It should not be forgotten that Mohammad Khatami’s (1997-2005), Iran’s first, post-revolutionary ‘President-Reformer’ extended an olive branch to the outside world in the form of a ‘dialogue of civilisations’. Instead, the obtuse American president, George W. Bush branded Iran as a pariah on an ‘axis of evil’. The language of boycotts and threats under Bush’s administration served to radicalise elements within Iran, who lost faith in the reform project, and ultimately ushered the way for the more radical president, Mahmoud Ahmadinejad to take power. Khatami’s conciliatory approach is ingrained in Rouhani’s political orientation and worldview. Since his investiture, Rouhani has explored a more dynamic and creative logic of engagement, while repudiating the politics of resistance and confrontation. Now in his second term, the question is whether external and rival powers will thwart Iran’s efforts to pursue a politics of normalcy both domestically and on the international stage. At this critical crossroads, it would be imprudent for the US to continue with its policy of containment. Crippling sanctions, threats of military intervention, cyber-warfare, regime change efforts, and covert actions to destabilise the government, only serve to radicalise even the most moderate elements of society. This approach only breeds more insecurity, which impinges on Iran’s institutional development and integration into the international community. Trump’s response to the terrorist attacks in Tehran and his Saudi Arabia extravaganza against Iran will only strain the region’s undercurrents of friction and boost conservative resistance towards the Rouhani whose efforts to carry forward a popular mandate will be severely hampered. When Rouhani came to power the question was whether domestically, he had the steering power to bring about substantive change and the ‘politics of normalcy’. Today, the question is whether Trump’s ill-advised and infantile foreign policy choices will provoke a volte face in Iran’s policy of engagement – à la Ahmadinjead – in the long-run.